…And for getting the engagement that you’ve been after. But today, I’m going to throw you a curveball. Because today, I’m going to tell you to STOP playing with your food. Hear me out. Because I promise, I’ve not totally lost my mind. I’ve been seeing a big trend in dog training lately. And I see it ALL of the time a dog events. Very well intentioned trainers and handlers will ask their dog to do something. Or they’ll simply cue engagement. Having the dog chase their reward…. When in all actuality, they are likely doing more harm than good. It’s frustrating – Check it out. If you’re asking your dog to perform a tricky behavior, they worked hard for that coveted cookie. And now, you’re making them work even harder? They’ve got to chase down their hard earned reward? That doesn’t seem all that fair. In fact, what you perceive as fun can actually be punishing for some dogs. So just hand over the cookie already. You can play afterwards if you want. It devalues the work – If you play huge, explosive food games after your dog completed a behavior involving multiple treats and lots of movement…and your dog LOVES the extra energy, treats, chase and play, your dog is going to be waiting…no begging for work…to end. I don’t know about you, but that’s not my goal in training. I want my dog to find value IN their work…I don’t want them waiting for it to be over already. In fact, if you ever watch me practicing something like a Focused Heel, all of the fun happens while my dog is heeling. Once they earned their cookie, things get awfully boring…this way my dog is always begging me for work, rather than begging for work to end. It devalues the reward – Food rewards are awesome tools for our dogs. But if you are always coupling food with big time play, that plain old cookie is going to seem pretty lame those times when you just want to hand it over. Unless you’ve got a total foodie, your dog will quickly start to lose motivation for basic food rewards, and you’ll find yourself in a vicious cycle of always having to make things way more exciting than they need to be. 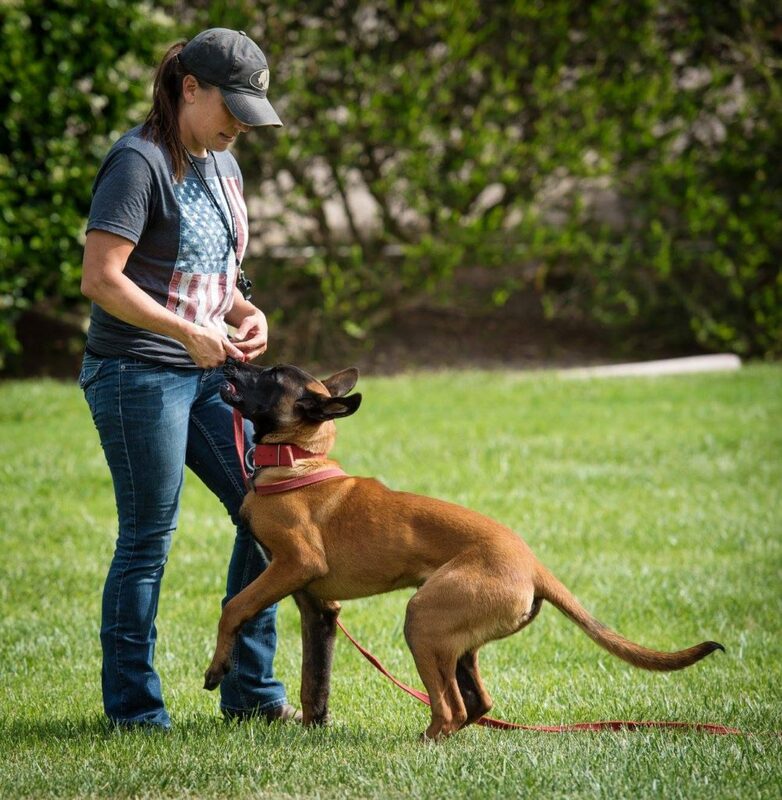 It tires dogs out – Listen, if I’m going to teach something like a Focused Heel, I want ALL my dog’s energy committed to the behavior. In fact, one of the biggest draws in using food is that we can log more reps without our dogs getting tired. Not so, if every reward is a giant game of chase. So now that I’ve told you to STOP playing with your food to reward behaviors you like, how can you use food play to be more effective? Here’s how to get strategic with your play…. 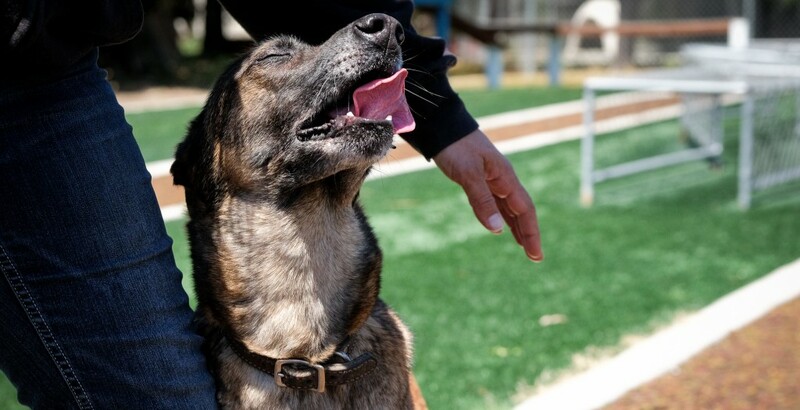 Use it to break up a tough training session – Rather than using food play or chase to reward behaviors, do a couple of treat tosses and some fast paced luring to break up tricky training sessions. By getting your dog moving and having fun, you’ll help them to destress, and you’ll shut off that brain for a bit if it’s getting overworked. 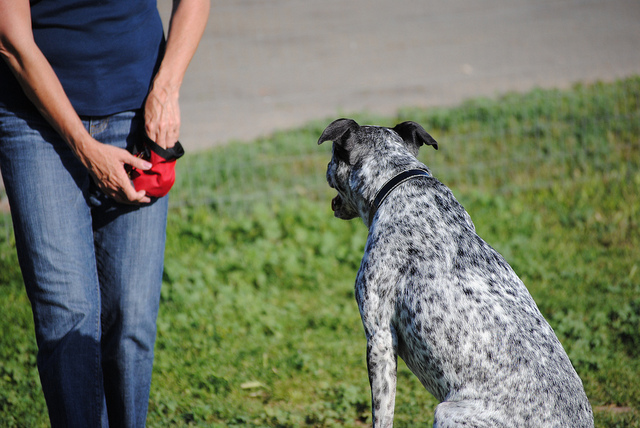 Use it to reset your dog – If I want to break my dog out of a position (for example, a down), so I can set up for another rep, I’ll toss treats away and let my dog chase them. Not only is this fun, it can help you log several reps to really drive home the lesson you are trying to teach. Use it when YOU make mistakes – Listen, I’ll be the first to tell you that mistakes in training are inevitable. We ALL make them. Especially when we are learning and practicing something new. So whenever you find yourself repeatedly making mistakes in training and you and your dog are getting frustrated, end the session and play some food chase games, then revisit the lesson after. This will get you and your dog moving and having fun, and will help you both out of overthinking. Use the anticipation for the reward to bring motivation to your behaviors – not a bunch of play and food chase (and if you don’t have enough anticipation to get the motivation you need, you’ve got some work to do). And use food play more strategically. Your dog (and their work ethic) will thank you. 8 replies to "Hand Over the Cookie: 4 Reasons to STOP playing with your food"
Excellent! The focus, energy and fun should be in the behavior and the learning, not in the delivery of the reward. Thanks Meagan, I’ve been thinking over this recently too as I notice my dog tires out quicker if I’m tossing treats for him to chase after each click during training. Your tips are great, thank you! I think the same could be said for ball on rope reward., maybe? I use the chase the ball a lot to reward and like you said Meagan I feel my girl is waiting for the Work to end so she can go chase the reward. Yes! Thank you for saying this. I too am not a huge fan of the cookie toss as a reward., though I will use a cookie toss strategically for a specific purpose. Apart from everything you’ve said, if you toss the cookie, where is the reward for your dog? Away from you. I want my dog to see ME as the source of reward, not the grass. Lots of great reading and advice…working through them. Question: I have a 2 year old Mal. I adopted him (Knight) little over a year ago. He is doing great. I’ve been working with him 2 to 3 nights a week. I also have been doing agility with him, He loves it! I am having problem with him chewing on things (I believe when he gets bored). He chews on rugs,, carpets, dog beds…etc. I do have many bones, chew toys & Kongs. I have tried spraying the ‘dog bitters’ on the items, but to no avail. Best bet is to increase mental stimulation, and exercise, and in the interim confine when you are unable to supervise 🙂 These guys require quite a bit of brain and body work and they LOVE using their mouths so the problem you are facing is not uncommon. More training, toy play, bones, food puzzles etc to keep him entertained, and a little bit of preventative action through confinement until he is trustworthy and you should be all set!